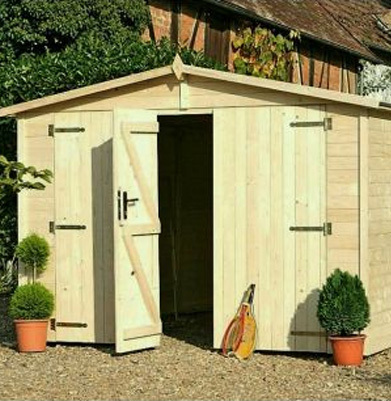 Shop for Garden is an online retailer of a wide variety of home and garden products, whether you want a timber frame garage, a shed, a bike store, or summerhouse in fact any type of timber garden building, cheap garden sheds and outhouses find them all here! Shop for Garden is the best place to find a quality wooden building to suit every setting. Our wood comes straight from the forests of Latvia and is turned by our craftsmen into timber framed garages and a great many other timber buildings. At our online store you will find timber, decking, fencing, sheds, timber framed garages, log cabins and accessories for your home and garden at very competitive prices all available for delivery directly to you. Great garden products at low, low prices. Our timber framed garages and other garden buildings will provide you with the extra space to store your car, tools, workshop items or anything else you need! We have such a large variety to choose from we are sure you’ll find something to fit your garden and provide safe and secure storage as well as being an attractive feature in itself. Whatever you need, you will find the perfect wooden garages and wooden buildings here. Timber frame garages and workshops etc are eco-friendly, simple and cheap to put up compared to brick built and with traditional and contemporary designs to choose from we are sure there will be something to suit your space, and pocket. Our timber garages are ideal for all types of use not just a home for the car! But of course, a timber framed garage makes a luxury home for your precious vehicle keeping it free from dust and dirt or accidental damage. Complementary buildings for your garden are available in a variety of timbers and roof structures. In fact, timber garage kits that you can erect yourself are always very popular as a cost-effective option for increasing your storage space! All products are made by the world’s leading manufacturers. Quality, simplicity and style are guaranteed at Shop for Garden – the online shop for your garden! Our product delivery can be typically be expected in 1-3 weeks from your order date. When you want timber framed garages, Shop For Garden is has a fine quality wooden building for any location which will fit the bill. Timber garages give you that much needed sheltered space to keep all your vehicles and tools and a timber framed garage makes the perfect sheltered winter workshop to get those jobs done. Our timber framed garages are solid and strong and have the great advantage of being condensation free. At Shop for Garden, it’s easy to find cost-effective timber frame garages for all your needs. Order online for fast delivery. Choose Shop for Garden for a great choice of quality sheds. Sheds made from best quality timber using sustainable materials. We use pure Northern European wood from managed forests for long life and durability. Full instructions are included on how to assemble and treat your shed so it lasts a long time. And, at the end of its long and useful life your garden shed is fully recyclable so nothing goes to waste. Each shed or garden building comes with clear instructions printed in English to help you to put it together. Among other things, our sheds make perfect garages, summerhouses or a garden office. Make the most of your outdoor space with a shed or garden building to fit your needs; choose all aspects of construction style, the number of doors, roof shape (pent or apex), windows, type of timber. It's best to have two or more people to help you assemble the larger projects and a solid foundation/base to build on (if required). Our cheap sheds, workshops, garages and garden buildings are great value and provide comfort and good cover from the elements with toughened glass for safety and security; use them for tool storage, a summerhouse, a garage, or potting shed; we have a range of wooden buildings to suit all. Your new great value shed or summer house is the ideal place to lock up your lawnmower, bicycle, barbecue or garden furniture for the winter, relax with a book or even somewhere to change after a dip in the pool.